Many studies have been reported regarding the effect of the physicochemical properties of the drug on the drug-to-carrier interaction and the fine particle fraction obtained during inhalation. For example, the type of drug,, the drug particle size, and the drug concentration in the interactive mixture and the duration of the blending time. Several techniques have been applied to prepare drug particles in the desired aerodynamic size range. These techniques include milling, spray drying, spray freeze drying, supercritical fluid extraction, and crystallization which are used to produce drug particles with controlled surface characteristics, compared to “jet milling” during which this cannot be achieved. In general, crystalline state of a drug is characterized by regular and well-defined molecular arrangement in the crystal lattice. Whereas, the amorphous materials lack order and possess excess thermodynamic properties such as enthalpy, entropy, and free energy. Amorphous form is thermodynamically unstable and is prone to transformation to stable crystalline form during processing and/or storage. Size reduction is known to introduce varying degrees of mechanical or thermal stress in the crystal lattice. This may lead to the generation of small proportion of amorphous form. This amorphous content is a minor component of the overall bulk and resides mainly on the surface of the particles., This small amount of amorphous material acts as “reactive spots” on the surface of a crystalline material and can introduce many formulation performance challenges., Therefore, it is critical to characterize even a small amount of amorphous content in a predominantly crystalline material. Various analytical techniques are available to quantify moderate-to-high levels of amorphous material in powders including differential scanning calorimetry (DSC), powder X-ray diffraction. However, these bulk analytical techniques measure the properties of the sample as a whole, and thus the amorphous content becomes a small part of the total signal. Hence, the detection limits for amorphous content with such techniques will generally have a lower cut off of 5%–10%. Very few techniques such as isothermal microcalorimetry (IMC), and dynamic vapor sorption (DVS) are capable of quantifying very low levels of amorphous content. Selection of experimental conditions and the mathematical treatment of the data made the use of techniques, such as IMC more complex. This study focuses on the influence of the micronization process on the physicochemical properties of salbutamol sulfate, which is used as a model drug interactively mixed with carrier materials. The size of a micronized particle will differentiate in the amorphous content that presents at the surface of the crystal. To improve the physicochemical stability of micronized particle, this study investigates the recrystallization of micronized salbutamol sulfate under storage conditions that are controlled with respect to relative humidity and temperature. Salbutamol sulfate was supplied kindly by Lindopharm (Hilden, Germany). Salbutamol sulfate particle was milled using an air jet mill (50 AS, Hosokawa Alpine AG, Augsburg, Germany). Micronized salbutamol sulfate was placed over silica gel in desiccator until further required. The particle size distributions of the micronized drug were determined with a Sympatec HELOS laser diffraction spectrometer equipped with a RODOS dry powder dispersing system (Helos H1402/Kf-magic and dry dispenser Rodos, Sympatec GmbH, Clausthal-Zellerfeld, Germany). The powder sample was fed to the dispersing air stream using a funnel connected to the injector of the dry disperser. The salbutamol sulfate powders were dispersed by compressed air at 2.5 bar. The particle morphology of salbutamol sulfate was examined using scanning electron microscopy (SEM) (LEO VP 1430, LEO Electron Microscopy Ltd, Cambridge, England), operated using an electron beam at the acceleration voltage of 20 kV and a working distance of approximately 18 mm. Samples (≈0.5 mg) were mounted through a graphite tape to an aluminum stub. After stripping off the upper side of the adhesive, a small amount of particles was scattered on the stub, the particles were then coated with ~15 nm–20 nm of gold with an Agar manual sputter coater (Agar Scientific Ltd., Stansted, Essex, England), using an electrical potential of 1.5 kV and the current of 20 mA. Conditioning of salbutamol sulfate at different relative humidities for different periods. Saturated salt solutions were used to maintain constant relative humidity levels inside small desiccators during the storage of drug particles. The following saturated salt solutions were used: magnesium nitrate (52.8%) and sodium chloride (75%). Relative humidity was measured within the desiccator using a thermohygrometer (Testo, Lenzkirch, Germany). The drug powder was placed in Petri dishes over those different relative humidities for 1 day, 1 week, and 2 weeks, respectively. Those conditioning steps were carried out at room temperature. Thermal stability and changes in crystallinity were investigated using a differential scanning calorimeter (DSC 30, Mettler-Toledo GmbH, Schwerzenbach, Switzerland) calibrated with indium. A small amount (≈3 mg) of salbutamol sulfate was crimp-sealed in an aluminum pan with pierced lid. The experiments were performed in the range from 0°C to 300°C under nitrogen flow of 50 ml/min. The scanning rate was adjusted to 10°C/min. Powder X-ray diffraction patterns of drug were obtained using the Miniflex powder diffractometer (Rigaku corporation, Tokyo, Japan) with a Cu-K αradiation (λ = 1.5406 Š) as the source of radiation. This diffractometer was operated at the voltage of 30 kV, and the current of 10 mA. All drug samples were measured in the 2 Å angle range between 5°C and 40°C. The gravimetric studies were undertaken in a humidity controlled microbalance system (Projekt Messtechnik, Ulm, Germany). The system is housed in an incubator to control temperature and surrounding humidity. The apparatus is computer controlled, allowing a preprogramming of sorption, and desorption isotherms. Approximately 3 g of drug samples were loaded; the relative humidity was first set to 0% and then raised in nine steps of 10% to 90% and one step more to 95%. Subsequently, the relative humidity was decreased from 95% to 90% then to 0% by the same way. This cycle was repeated once more. The sample holder contains 11 stainless steel cups, which carry 11 samples in each time. The particle size distribution of salbutamol sulfate was measured using laser diffraction. Volume median diameter and span were calculated. The original size of raw salbutamol sulfate before milling was about 8.3 ± 0.03 μm in diameter. After micronization, the particle size using laser diffraction was summarized using X10, X50, and X90 values. The vast majority of salbutamol sulfate particles were smaller than 5 μm (X50= 2.03 μm ± 0.07 μm (mean ± standard deviation), X10= 0.63 μm ± 0.32 μm, and X90= 5.33 μm ± 0.06 μm. SEM micrographs were taken by scanning fields, selected randomly, at several magnifications. As shown in [Figure 1], the salbutamol sulfate particles appear as needle-shaped particles before as well as after micronization by air jet milling. Salbutamol sulfate stored at different relative humidities was investigated by DSC, X-ray diffraction, and water vapor sorption to determine the effect of the conditioning process on the drug crystallinity. DSC as one of the standard techniques for the determination of crystallinity was performed on unmicronized salbutamol sulfate and micronized salbutamol sulfate stored for 24 h at silica gel, at 52.8% relative humidity (RH) and 75% RH for 1 day, 7 days, and 14 days, respectively. The DSC thermograms [Figure 2] show no exothermic peaks of the micronized salbutamol sulfate, which indicates the absence of the amorphous content. The enthalpy of fusion of salbutamol sulfate [Table 1] was changed from 232.93 ± 2.75 J/g directly after milling through the air jet mill to 232.93 ± 2.75 J/g and after conditioning at different relative humidities and for different periods. The enthalpy of fusion after storage at silica gel (0% RH) for 24 h was 230.60 ± 1.05 J/g that changed to 251.12 ± 2.77 J/g after storage for 24 h at 50% RH. The unconditioned and conditioned micronized salbutamol sulfate were examined using X-ray diffraction as a further standard technique determining the crystallinity. The unconditioned and conditioned samples appear to be crystalline in nature, and no broad peaks due to amorphous parts are visible [Figure 3]. The construction of the water vapor sorption system (SPS11) is based on a microbalance capable of measuring changes in sample mass lower than 1 part per million. Sorption studies can only be performed on solid samples such as powders, granules, pellets, and films. The sample should be packed in a manner so as to expose maximum surface area. In general, the small particle size is preferred for this technique because smaller the particle size, larger will be the surface area and higher will be the sorption, Too dense, packing should not be carried out as it may hamper the entry of vapors in the core of the sample. The equilibrium condition was set to 0.01% mass change per 60 min; the whole measurement was run for only one time due to the time-consuming of this type of experiments. The water vapor sorption data of crystalline salbutamol sulfate are shown in [Figure 4]a. The higher the humidity increases, the higher is the mass gain and decreasing the relative humidity after reaching 95% RH leads to a decrease in the mass. By spray drying, amorphous salbutamol sulfate particles are obtained. The corresponding sorption data are shown in [Figure 4]b. In contrast to crystalline salbutamol sulfate, there is a mass decrease observable at 50% RH and above. The calculation of the amorphous content showed that the micronized salbutamol sulfate contains 1.65% amorphous material. It is obvious that the micronized salbutamol sulfate [Figure 4]a, contains a small amorphous content and this content recrystallizes at 50% relative humidity. The micronized salbutamol sulfate samples conditioned for 24 h at 52.8% RH and 75% RH still show amorphous parts [Figure 4]c and [Figure 4]d, respectively] indicating that recrystallization has not been completed yet. Using the calculating method mentioned by Gorny et al., 2007, it has been found that the amorphous content of salbutamol sulfate stored at 52.8% and 75% relative humidity is 0.35% and 0.29%, respectively. Conditioning of micronized salbutamol sulfate at 52.8% and 75% RH for 2 weeks, respectively, was done at ambient temperature to obtain a stable milled material. Again, the samples were analyzed by water vapor sorption [Figure 4]e and [Figure 4]f, respectively]. Both samples show almost fully crystalline behavior. It has been found that the amorphous content of salbutamol sulfate stored at 52.8% and 75% relative humidity for 2 weeks is 0.022% and 0.018%, respectively. The size of the active ingredient is particularly important in the dry powder inhalation field to offer effective delivery of the drug particles to the distal parts of the lung, where the drug particles should be small particles with an aerodynamic diameter of 1 μm–5 μm. Laser diffraction analysis relies on the fact that particles scatter light at angles in inverse proportion to their size. The salbutamol sulfate particles were smaller than 5 μm (X50= 2.03 μm ± 0.07 μm (mean ± standard deviation), which suggests that the drug powder was suitable for DPI formulation. However, it should be noted that laser diffraction measures the geometric diameter whereas particle deposition is determined by the aerodynamic diameter. The scanning electron micrographs of the salbutamol sulfate are shown in [Figure 1]. Micronized salbutamol sulfate tends to adhere to each other forming agglomerates. Those agglomeration tendencies were authorized due to high energetic particle surfaces. Unmicronized particles show larger particles in comparison to micronized particles, which are in agreement with the laser diffraction analysis results. Conditioning of salbutamol sulfate was carried out to remove the amorphous parts possibly present on the particle surface and revert them into crystalline parts, which are stable. Conditioning was carried out by storage at 52.8% and 75% for different periods. Storage was also carried out without conditioning using silica gel to compare the raw material with conditioned powders. The amorphous part can be transferred into crystalline by reducing the Tg of the substance below room temperature. This recrystallization may result in size increase of the micronized substance. Particle growth may generate fractions of the particles with diameters outside of the respiratory range (1 μm–5 μm). Conditioning of salbutamol sulfate may convert the amorphous parts into crystalline solids under storage conditions, which are controlled with respect to relative humidity and temperature. These conditions aim at reducing the glass transition temperature Tg of the solid material by sorption of water and setting the surrounding temperature to values above Tg at which the molecular mobility and consequently the crystallization process is accelerated. Although the water vapor sorption detects small amorphous parts in the micronized salbutamol sulfate, the DSC thermograms [Figure 2] show no glass transition. DSC thermograms show no detectable Tg, which explore the difficulty of determining small amorphous content using the DSC. This can be related to the detection limit of this technique, which is limited to 5%–10% of amorphous content. [Table 1] shows a change in the enthalpy of fusion for micronized salbutamol sulfate before and after conditioning steps. This enthalpy change could be related to the presence of small amorphous part in the milled and conditioned powder, which was under the detection limits of the DSC technique. The X-ray diffractograms showed no halopeaks of amorphous micronized salbutamol sulfate. The XRD diffractograms show no detectable amorphous content (no halo-peaks), which appear hard to use this technique in determining minute quantity of amorphous content in crystalline drugs. Those results come in agreement to the results obtained from DSC, which suggest the absence of amorphous parts. However, if there are amorphous parts <5%–10%, which are the detection limits for amorphous amount with this technique, they would not be detected. Over recent years, a number of research papers have been published using IMC to quantify low levels of amorphous contents.,,, In addition, water vapour sorption was used to determine the amount of amorphous material in salbutamol sulfate, which was used as active ingredient in this study. Amorphous salbutamol sulfate particles are obtained using the spray drying technique. Sorption data are shown in [Figure 4]b, Gorny et al., The comparison of the amorphous and the crystalline salbutamol sulfate water vapor sorption isotherms shows a mass decrease observable at 50% RH and above due the expulsion of excess water following recrystallization of the amorphous content. The amorphous spray-dried salbutamol sulfate recrystallizes at 50% relative humidity by expelling the water. This leads to a decrease of the mass of salbutamol sulfate. To remove amorphous parts from the drug particles and to ensure that crystalline material, that is stable on storage, will be used for the preparation of ordered mixtures with the carrier, conditioning of the drug was performed at 52.8% RH and 75% RH for 1 day and 2 weeks, respectively. After conditioning for 1 day and 2 weeks, the first mass loss is detectable at 0% RH, this is caused by the loss of water, which has not been removed during storage over silica gel before analysis. Significant differences in the total amount of water sorbed are observed with the unmicronized material having a maximum value approximately 12 fold greater than the micronized material at 95% RH. This was somewhat unexpected based on the large differences in both particle size and surface area between these two samples. Uptake of such large quantities of water can occur as the result of hydrate formation, deliquescence, or capillary condensation. To the author's knowledge, no hydrate forms of salbutamol sulfate have been reported. 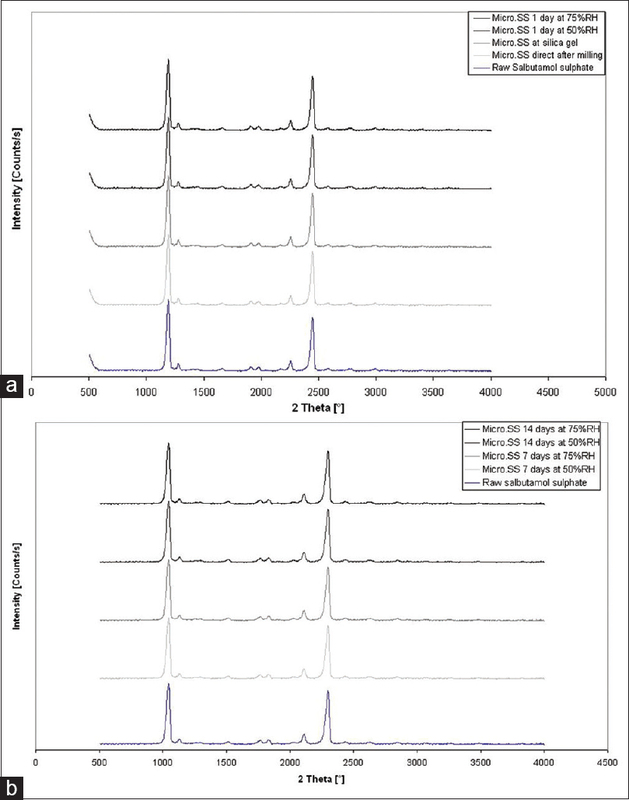 This study shows that the use of water vapor sorption is a good tool to detect small amorphous contents in micronized salbutamol sulfate powder. The use of DSC and X-ray diffraction was not adequate to detect an amorphous content <10%, which comes in agreement with the results of the previous studies. Furthermore, the results show that conditioning of milled salbutamol sulfate is not only dependent on relative humidity but also on storage time and temperature. Furthermore, relative humidity as well as storage time has to be carefully controlled to obtain a thermodynamically stable drug product. In addition, the micronized salbutamol sulfate must be conditioned minimally for 2 weeks at 52.8% RH at room temperature to get stable crystallized salbutamol sulfate, which could be used further in production of drug-carrier mixture used for dry powder inhalation formulas. 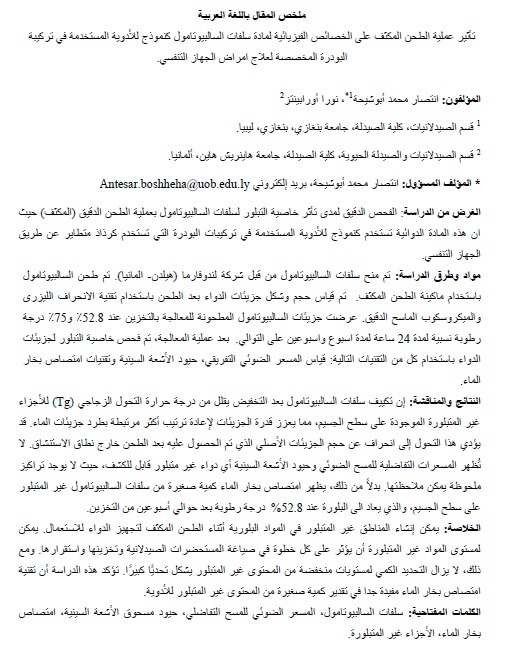 This study was financially supported by Scholarship from the Libyan government 2003-2009. Clarke MJ, Peart J, Cagnani S, Byron PR. Adhesion of powders for inhalation: An evaluation of drug detachment from surfaces following deposition from aerosol streams. Pharm Res 2002;19:322-9. Podczeck F, Newton JM. Development of an ultracentrifuge technique to determine the adhesion and friction properties between particles and surfaces. J Pharm Sci 1995;84:1067-71. Kulvanich P, Stewart PJ. The effect of particle size and concentration on the adhesive characteristics of a model drug-carrier interactive system. J Pharm Pharmacol 1987;39:673-8. Chawla A, Taylor KM, Newton JM, Johnson MC. Production of spray dried salbutamol sulphate for use in dry powder aerosol formulation. Int J Pharm 1994;198:233-40. Costantino HR, Firouzabadian L, Wu C, Carrasquillo KG, Griebenow K, Zale SE, et al. Protein spray freeze drying 2. Effect of formulation variables on particle size and stability. J Pharm Sci 2002;91:388-95. Shekunov BY, Chattopadhyay P, Seitzinger J, Huff R. Nanoparticles of poorly water-soluble drugs prepared by supercritical fluid extraction of emulsions. Pharm Res 2006;23:196-204. Buckton G, Darcy P. The use of gravimetric studies to assess the degree of Crystallinity of predominantly crystalline powders. Int J Pharm 1995;123:265-71. Shah B, Kakumanu VK, Bansal AK. Analytical techniques for quantification of amorphous/crystalline phases in pharmaceutical solids. J Pharm Sci 2006;95:1641-65. Strydom S, Liebenberg W, Yu L, de Villiers M. The effect of temperature and moisture on the amorphous-to-crystalline transformation of stavudine. Int J Pharm 2009;379:72-81. Buckton G, Darcy P. Assessment of disorder in crystalline powders – A review of analytical techniques and their application. Int J Pharm 1999;179:141-58. Gorny M, Jakobs M, Mykhaylova V, Urbanetz NA. 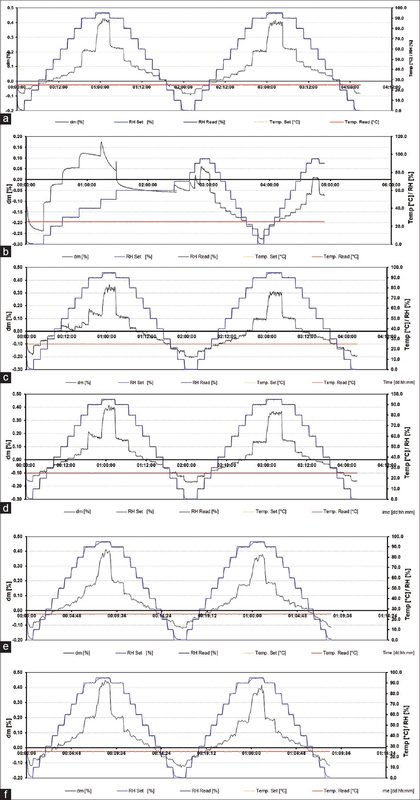 Quantifying the degree of disorder in micronized salbutamol sulfate using moisture sorption analysis. Drug Dev Ind Pharm 2007;33:235-43. 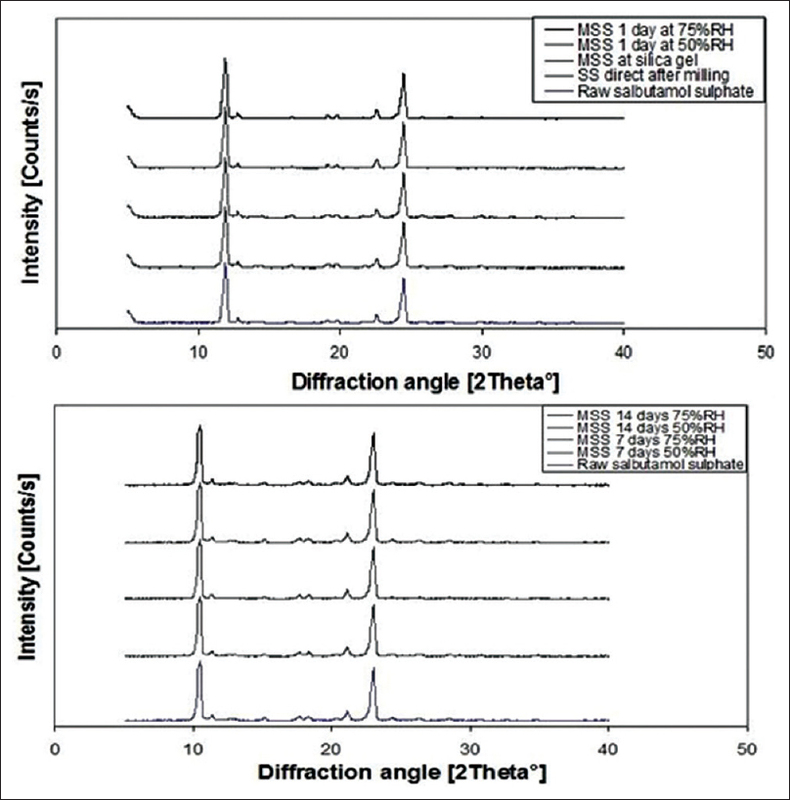 Sebhatu T, Angberg M, Ahlneck C. Assessment of the degree of disorder in crystalline solids by isothermal microcalorimetry. Int J Pharm 1994;104:135-44. Young PM, Chiou H, Tee T, Traini D, Chan HK, Thielmann F, et al. The use of organic vapor sorption to determine low levels of amorphous content in processed pharmaceutical powders. Drug Dev Ind Pharm 2007;33:91-7. Mackin L, Zanon R, Park JM, Foster K, Opalenik H, Demonte M, et al. Quantification of low levels (<10%) of amorphous content in micronised active batches using dynamic vapour sorption and isothermal microcalorimetry. Int J Pharm 2002;231:227-36. Sneha S. Sameer RM, Arvind KB. Dynamic vapor sorption as a tool for characterization and quantification of amorphous content in predominantly crystalline materials. J Pharm Sci 2014;103:3364-76. Martin S. Control of conditioning atmospheres by saturated salt solutions. J Sci Instrum 1962;39:370-72. Begat P, Kattige A, Price R, Young PM. Characterization of the Surface Physico-Chemical Stability of Materials Directly Applicable to Inhalation Therapy. International Conference of the IEEE; 2003. Feeley JC, York P, Sumby BS, Dicks H. Processing effects on the surface properties of a-lactose monohydrate assessed by inverse gas chromatography (IGC). J Mater Sci 2002;37:217-22. 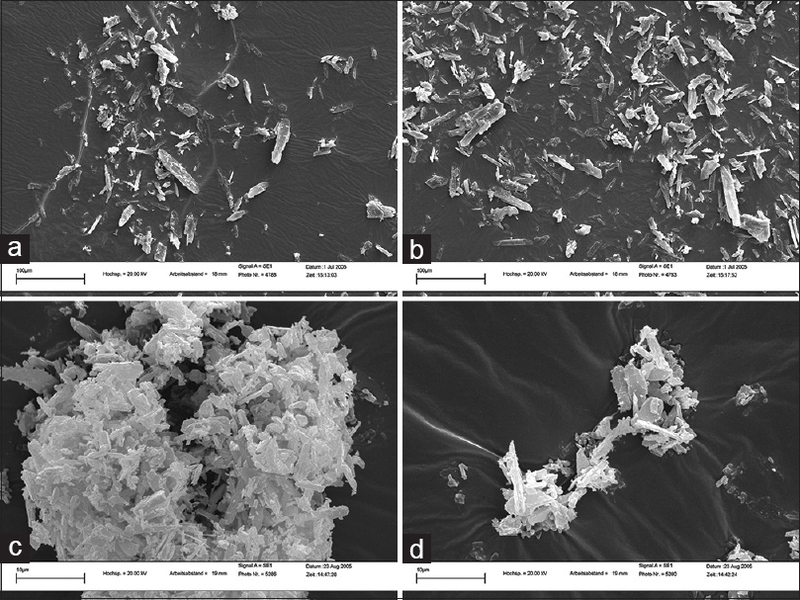 Briggner LE, Buckton G, Bystrom K, Darcy P. The use of isothermal microcalorimetry in the study of changes in crystallinity induced during the processing of powders. Int J Pharm 1994;105:125-35. Ward GH, Schultz RK. Process-induced crystallinity changes in albuterol sulfate and its effect on powder physical stability. Pharm Res 1995;12:773-9.